Following on from the successes of the other APT in 2006, this is an exhibition of alterNATIVE perspectives held in response to the state government-run Asia Pacific Triennial. 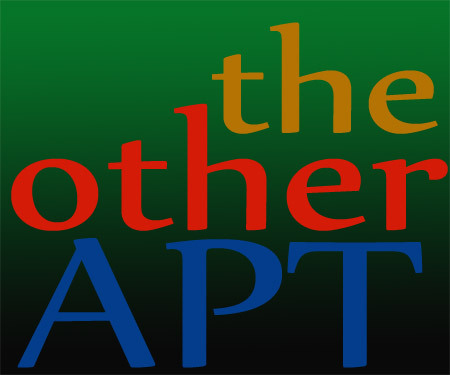 the other APT will feature a range of artworks from Australian-based artists from various cultural backgrounds and artforms in 2012/2013. 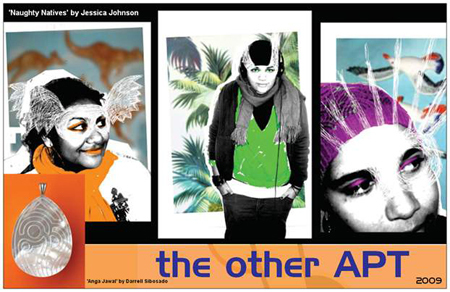 Coinciding with and responding to the Asia Pacific Triennial, 'the other APT' exhibition featured works from Aboriginal, Torres Strait Islander and Australian-based Melanesian, Polynesian, Maori & Asian Artists across all artforms. 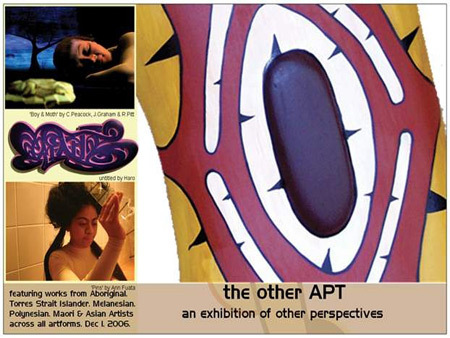 the other APT opened at Raw Space Galleries, Brisbane, 1st December, 2006, until 23rd January 2007.